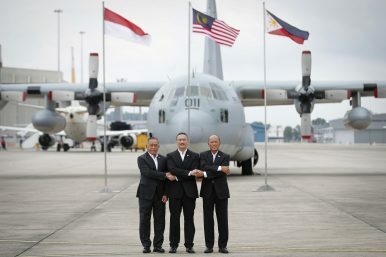 From left to right, Indonesia's Defense Minister Ryamizard Ryacudu, Malaysia's then Defense Minister Hishammuddin Hussein and Philippines' Defense Secretary Delfin Lorenzana join their hand for a group photo after the launch of the countries' joint air patrols at Subang military airbase in Petaling Jaya, Malaysia, Oct. 12, 2017. Economic development in coastal communities will help stem the flow of illegal behavior. Maritime insecurity in the Sulu and Celebes Seas is a persistent challenge. These waterways have recently been used to conduct incursions into Lahad Datu, orchestrate kidnap for ransom activities by militant groups such as Abu Sayyaf, and facilitate illegal wildlife trafficking. Governments in the Philippines, Indonesia, and Malaysia have responded with increased maritime enforcement capacity and presence, as well as enhanced international coordination. Although these are important efforts that need to be maintained, an exclusive focus on enforcement capacity risks ignoring an equally important facet of maritime insecurity: economic exclusion and inequality in coastal communities. Coastal communities around the Sulu and Celebes Seas generally have lower levels of economic development than national economic hubs. A recently-released report by Stable Seas, a global maritime security organization, indicates coastal poverty can cultivate feelings of economic exclusion, undermine the rule of law, and generate a fertile recruiting ground for illicit actors. In the Malaysian state of Sabah, for example, hundreds of thousands of Filipino migrants and refugees are often restricted to informal or low-paying work and lack access to government services such as education, sanitation, and healthcare. This relative economic dislocation creates a community at severe risk of turning to illegal markets and illicit groups for survival. On Borneo, Indonesia’s East Kalimantan province has witnessed significant economic development in sectors such as coal production. However, North Kalimantan has significantly lower levels of public service provision. This relative deprivation of social services is particularly stark in indigenous communities, whose way of life is also threatened by deforestation and shrinking access to land. Though this has historically been one of the wealthier areas in Indonesia, stagnant economies and declining oil production risk an increase in the same illicit economic activity that threatens less developed coastal regions. Along the southern rim of the Celebes Sea, in Sulawesi and North Maluku, poverty rates are in decline, but economic inequality is on the rise. Research demonstrates that relative deprivation is an important driver of conflict, as it can drive socioeconomic groups at the nexus of identity and economic exclusion toward illicit maritime activity and political violence. This risk is especially acute if the region’s new economic gains are not perceived to be shared equally among the area’s many ethnic, religious, and linguistic communities. In the Philippines, residents of Mindanao generally suffer from relatively poor access to government services and public goods. Education services are limited in comparison to other parts of the country. This lack of access to social services has generated significant economic exclusion as, regional incomes remain below national averages and rates of poverty and unemployment are notably higher, with per capita GRDP in the Autonomous Region of Muslim Mindanao being roughly one-fifteenth of that in Manilla. When combined, these factors can undermine trust in national institutions. Public distrust can then contribute to militancy onshore, which often translates into maritime insecurity when coupled with the weak capacity to project law enforcement and governance at sea. This economic exclusion and unequal service provision enable illicit economies and armed groups. To tackle insecurity in the region, the governments of the Philippines, Indonesia, and Malaysia have tried to bolster their ability to counter security threats at sea. One example is through mechanisms such as the Trilateral Cooperative Arrangement, which provides a framework for coordinated patrols and expanded information sharing. Maritime enforcement is clearly important to mitigate security threats. However, even modest naval procurement efforts can be extremely expensive and these costs need to be balanced with other priorities to maintain a comprehensive maritime security strategy. When enforcing maritime security in the Sulu and Celebes Seas, building the capacity of local maritime law enforcement agencies is extremely critical. Unlike navies, maritime law enforcement agencies have the mission and training to address specific nontraditional security threats that are prominent in the area. Additionally, their vessels tend to be considerably less costly than naval infrastructure. The further development of maritime domain awareness in the Sulu and Celebes region through increased community engagement efforts is also needed to establish normal patterns of maritime activity and detect emerging threats. Beyond enforcement, more effort is needed to ensure that the economic interests of marginalized coastal communities are protected. Progress has been made in this area, but more needs to be done. Ensuring equitable provision of public goods and services to coastal communities that are isolated by geography would reduce sentiments of exclusion and reduce the risk of militancy. Additionally, more investment in the sustainable development of blue economy industries like fisheries and tourism will provide alternative livelihoods for those at risk of turning to illicit maritime activity. Jay Benson is a Senior Researcher with OEF Research, a nonprofit research organization focused on issues of international conflict and governance. His work concentrates on maritime security, peacekeeping operations, and civilian protection. This article is derived from his research with Stable Seas, a program of OEF that provides novel research on maritime security issues. While the initiative continues to make headway, challenges remain with respect to its operationalization.